While your MDA Care Center visit will vary depending upon whether it’s a diagnostic evaluation or follow-up visit, one thing to know is that you’ll find dedicated teams of expert health professionals skilled in the diagnosis and medical management of neuromuscular diseases. Such management ranges from measures for controlling symptoms to medical interventions designed to enhance quality of life and independence. If your physician suspects you may be affected by a neuromuscular disorder included in MDA’s program, we encourage you to contact the MDA Resource Center to be connected to an MDA Care Center, or search for your nearest center here. The diagnostic process depends in large part upon which neuromuscular disease is suspected. An experienced MDA Care and Clinical Services Specialist will be available to answer questions, provide educational materials, coordinate any services you may need and assist with community resource referrals. Follow-up visits are usually scheduled annually, but at certain stages in the progression of your disease, more frequent checkups may be indicated. Depending upon your diagnosis, consultations with various specialists may be recommended, such as a cardiologist or pulmonologist. Initially, the purpose of such visits may be to establish baseline measurements of heart or respiratory function so that these can be monitored for changes. 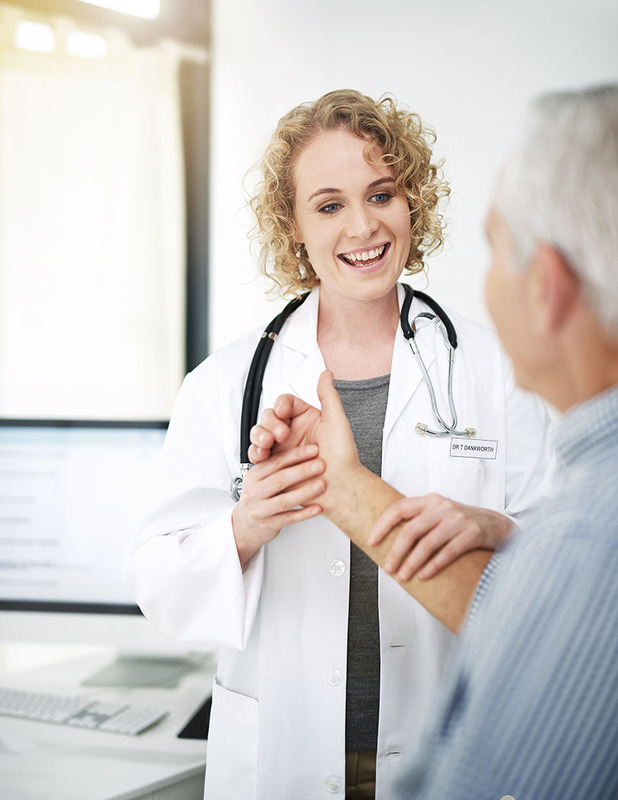 An MDA Care Center physician may prescribe physical, occupational, respiratory and/or speech therapy to be administered by a certified practitioner. Therapy may be offered at the MDA Care Center, at another facility or in the home. Physical therapy: A physical therapist will conduct a consultation to evaluate the need for physical therapy, and instruct family members and others on how to administer prescribed exercises. Physical therapy can neither arrest the disease process nor restore affected muscle tissue. It may, however, help keep still-healthy muscles functioning, and may delay the onset of contractures and provide an individual with greater range of motion. Occupational therapy: Individuals will receive guidance on how to make maximum use of their physical capabilities by being instructed in the use of specially designed implements and daily living aids in their home and work environments. Respiratory therapy: The use of prescribed respiratory therapy equipment is designed to augment or increase vital lung capacity. Speech therapy: Evaluate the muscles responsible for speech and swallowing. Through such an evaluation, a speech-language pathologist can determine if exercise, use of an augmentative, alternative communication device (AAC), and/or modifications to meals are appropriate. Social services are a vital aspect of the MDA family and clinical support program. MDA local offices and MDA Care Centers may provide additional resources for families seeking direction in identifying alternative sources of payment for medical services and assisting with the identification of resources to maintain quality of life and independence. Your MDA care and clinical services specialist is available to discuss local resources and answer any questions you might have. If you would like to explore resources by someone on the MDA team, please contact 1-833-ASK-MDA1 (1-833-275-6321). A summary report may be made available upon request to your personal physician after the initial MDA Care Center examination and after each follow-up visit. In addition, your MDA Care Center physician may advise your primary care physician on problems related to your specific conditions. Genetic counseling may be provided to families of those who have any of the inherited neuromuscular diseases. Genetic counselors can assist in obtaining and interpreting genetic (DNA) tests, insurance coverage for genetic testing, and identifying others within the family who may be at risk for the genetic disorder. Genetic counselors can help families obtain a diagnosis for a genetic condition, determine whether parents of an affected child are carriers of the disorder, and educate families regarding the risks of passing on the disease to future generations.